Presently we are creating seventeen doll designs, reflecting the distinct costumes of the three major regions of Tibet. By reaching out to a wide range of people our aim is to develop more international awareness and appreciation of the country’s rich cultural heritage and unique beauty. 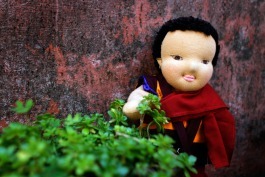 Our Bopa Dolls offer even the youngest child an opportunity to playfully participate in Tibet’s cultural conservation. 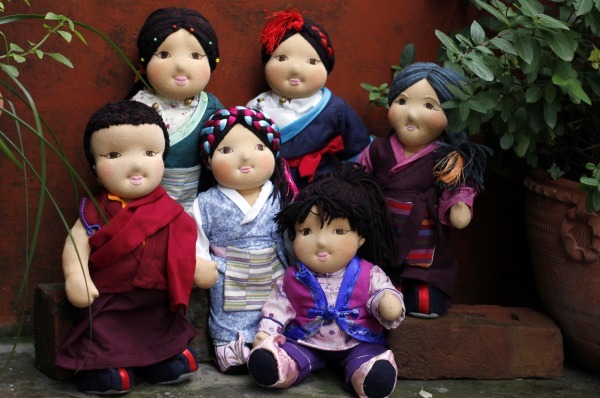 Also, as we are based within the Tibetan refugee community in India – and the majority of the women working in our project are refugees from Tibet – we’ve been aiming to develop relevant products with which our Doll Makers can easily identify and feel empowered to contribute in their own unique way to the preservation of their treasured culture. 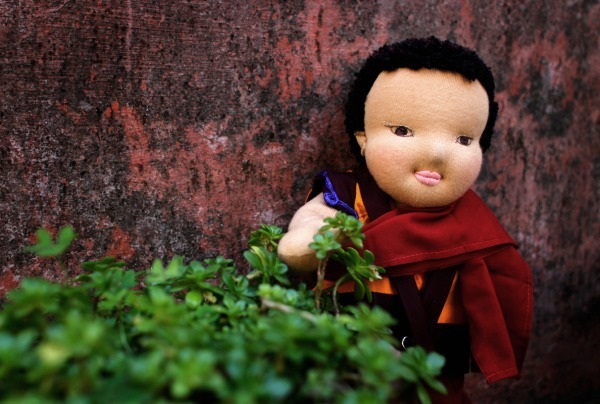 At the same time we’ve been thinking of Tibetan children here in exile and around the world – many sent away by their families in the belief that their children can better flourish and preserve their language and heritage within an exile environment. 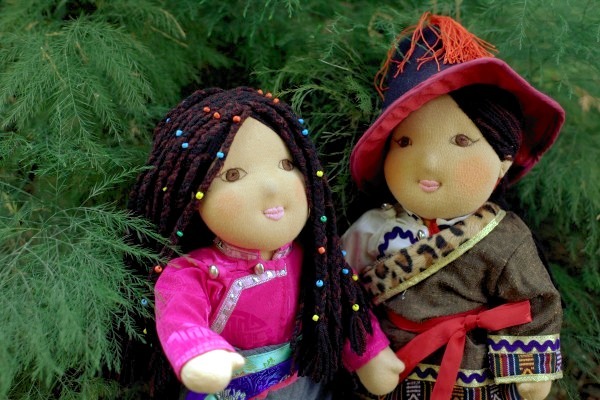 Our range of Bopa Dolls provide a close connection to these children’s cultural roots as they can easily identify with them. Although many people may be acquiring our dolls as unique cultural artefacts, a challenge in designing them has been to create an acceptable middle way between offering the rich and detailed characteristics of traditional Tibetan costumes and hairstyles while remembering the needs of children. 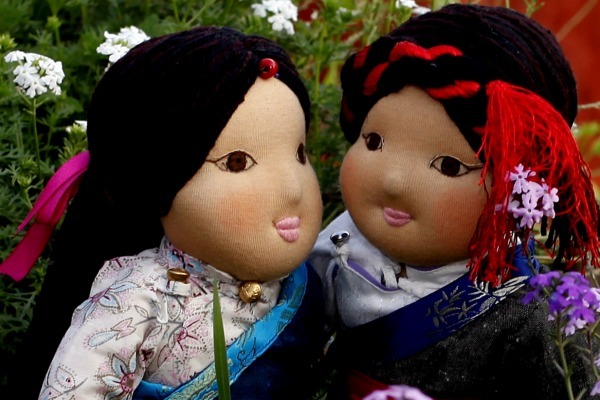 So as well as being culturally authentic, our dolls are safe and child-friendly, can be enjoyed in play and become treasured companions. In the U-Tsang region (Central Tibet including the capital Lhasa) the dresses are more stylish and town-like and nowadays the majority of Tibetan women in exile have adapted to wearing these distinctive ensembles. 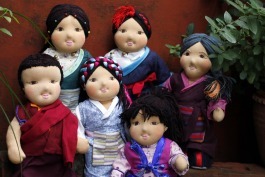 Although many small variations occur, Tenzin, Samdol, Tsewang and Norsang are all typical characters from U-Tsang. Choeying and Thinley are typical characters from the Kongpo County in the south eastern part of Central Tibet, bordering Kham. This area is famous for its many rivers, magnificent mountain gorges and – due to its comparatively mild and humid climate- spectacular lush and diverse forests. It is also known as one of the important cradles of ancient Tibetan civilization as Tibetans settled here since more than five thousand years. 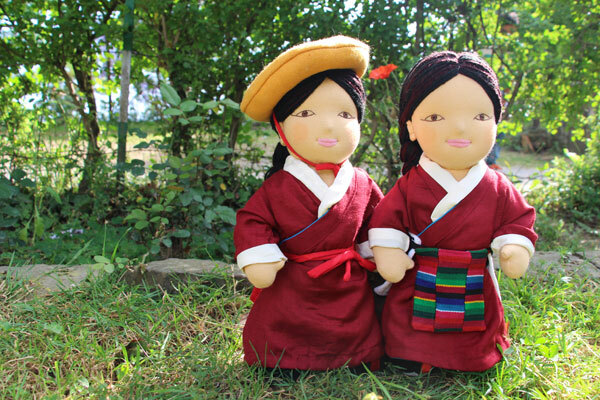 Besides many unique Kongpo customs and ways of life, their distinctive traditional garments are outstanding and very impressive and we are most happy to finally include them in our traditional Tibetan section. Choeying and Younten are typical of this region. The Kyirong County lies in the Southwest of U-Tsang, close to the Nepali border. It is a stunning isolated valley (also called the ‘valley of happiness’), surrounded by breath-taking mountains and grassy meadows. Most people in Kyirong are farmers or shepherds, and their traditional attire is distinctly different from all other Tibetan regions. 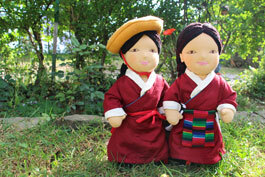 Kyirong men and women wear similar maroon colored chupas and white blouses beneath. But the men wear a dashing bright yellow flat hat and a unique silken pouch attached to their belts, used to carry personal daily essentials. And kyirong women wear a unique back apron as well as the more common stripy front apron – probably to keep them warm and protected during the many cold high mountain days and nights. Thinley and Yangchen represent this region. The Amdo region of North-eastern Tibet is dominated by vast lakes, steppes and grasslands and most people lived a sparse nomadic life well-attuned to their pastoral environment. However, in contrast to their surroundings, the Amdo people’s traditional attire is sophisticated and full of bright colours, exquisite brocades and adorned with many precious and semi-precious stones. Lhamo Tso and Lhamo Kyab reflect these visual delights. The Kham region is an extremely fertile area of Eastern Tibet with substantial forests and diverse wildlife. Most Khampas are traders, farmers and nomads and are known to be brave, faithful and sincere. 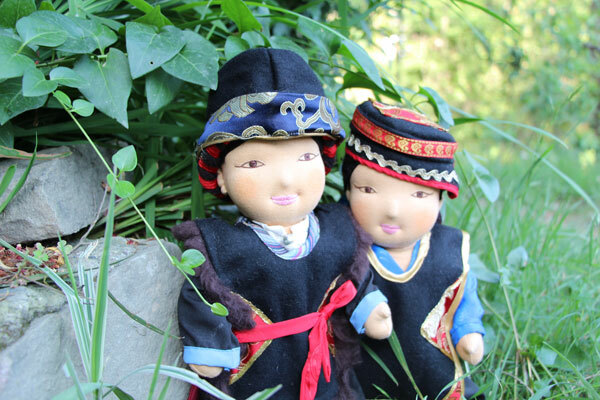 Their traditional costumes are similar to those of Amdo, with the girls exhibiting shiny brocades and precious stones, while the men are outstanding with bright red silk threads decorating their long hair. 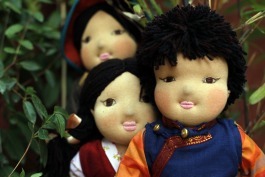 Sonam, Dolkar, Dekyi and Norbu are displaying these characteristics. 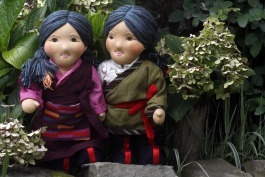 As the monastic tradition and Buddhist beliefs are strongly-anchored within Tibetan society, we’ve added a typical Nun and Monk doll to our collection. However, we intended them to be exclusively decorative, as the robes themselves are viewed as symbols of Tibetan Buddhism and should be treated with respect. Tenchoe is our nun and Lobsang our monk. 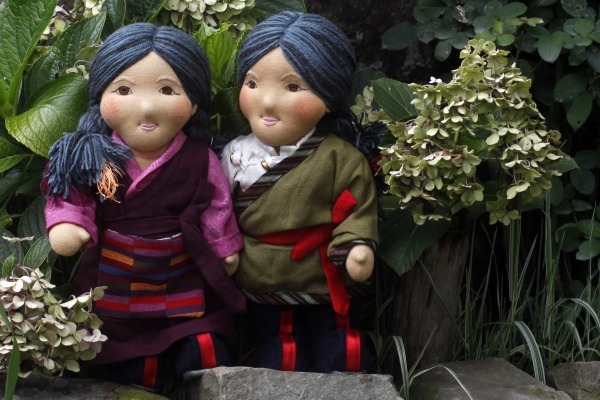 As the traditional family setting is an important aspect of everyday Tibetan life, we lovingly included Grandparents to our Bopa Doll collection. These special characters symbolize the sense of belonging, gentle care and cultural continuity we find within the extended family – qualities particularly important for young children. Tsering is our Grandmother and Jampa our Grandfather.